Have you ever wondered how to use an anti static mat? Are you thinking about working on your computer, or finding that product yields are decreasing in your facility? If you are assembling electronics the drop in product yields is probably being caused by static electricity. Anti static mats are used to dissipate static electricity from work surfaces so that electronics are not destroyed by ESD (electrostatic discharges). Here’s a basic rundown of the types of anti static mats, how to use an anti static mat, and what to monitor and test once you have created a workstation with the mat. Anti Static Mats for a computer or pc building are placed over tables to dissipate static charges from those work surfaces. Anti Static Mats are typically static dissipative on the top, and conductive on the bottom. Anti static mats are “grounded” by being placed on top of a conductive work surface or by using grounding cables to connect them to an electrical outlet. The bottom surface is impregnated with carbon which is why it is black. The Ohms scale is used to classify a material’s resistance to charge. A material is static dissipative if it offers between 1 x 10e6 and less than 1 x 10e12 ohms of resistance. A material is conductive if it offers less than 1 x 10e6 ohms of resistance. Since carbon is conductive if the mat is laid on top of conducting tables and floors static will travel through the mat, into the table, and dissipate at the floor into the ground. However, typically you will want to connect an anti static mat for pc building to an electrical outlet. Electrical outlets are normally the best ground for a mat in any building. This is because the wiring of outlets typically follows the piping of the building to earth underneath the building. A material is insulative if it has greater than 1 x 10e12 ohms of resistance. Common insulators are carpets, floor paints, glass, plastics, and wood. Insulating materials cause static to be created on work surfaces and contribute to electrostatic discharges (ESD) being created. 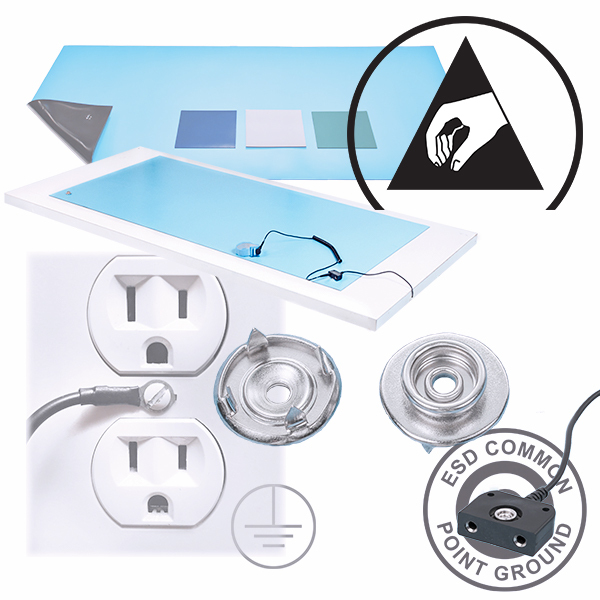 If an anti static mat is isolated from electrical ground by insulators (carpets, painted floors, or tables), you need to connect it to an electrical outlet by using a grounding cable. To “ground” anti static mats, we insert a conductive snap on the corner of the anti static mat. The snap is where you will connect the grounding cable. The conductivity of the snap will create a dedicated path for static to travel off the mat and into the cable. There are two primary types of grounding cables you can use to connect an anti static mat to an electrical outlet. A mat ground is used to ground the mat separately from other surfaces. A common point ground is used to ground the mat and a wrist strap at a common point. Grounding cables made in the United States typically end in an “eyelet” – a #10 ring terminal– to screw directly into a standard US electrical outlet. Grounding cables typically come with 1 meg ohm (1 x 10e6 ohms) resistors to ensure that electricity moving through them is always traveling at a static dissipative rate. The purpose of the resistor is to slow down an electrostatic discharge event (ESD) from a highly charged ungrounded surface from discharging instantaneously through the cord. The resistor slows down ESD a few more milliseconds than if it were not present. A continuous monitor is an alternative to using mat grounds. When a monitor is used it is to guarantee the ground connection of an anti static mat and a wrist strap. They audibly and visually alert you when the mat or the wrist strap is not grounded. “Wave Distortion” or vector impedence, is the most reliable technology for continuous monitoring of wrist straps. It works by applying a continuous test voltage to the wrist strap and monitoring the distortions. The standard used internationally to test anti static mats is ESD Association Standard Test Method (STM) 4.1- 2017 “Worksurfaces-Resistance Measurements”. It recommends two tests – resistance measured top-to-top (RTT), and resistance measured top-to-ground (RTG). The resistance top-to-top test measures whether or not the mat is static dissipative on its top surface. The resistance top-to-ground test measures whether or not the mat is conducting to ground at a static dissipative rate. < 1 x 10e9 ohms of resistance in an RTG test is generally considered the high end of what is suitable for an anti static mat that will be used for an activity like pc building. To perform these tests you would use an ESD Resistance Meter. The meter will charge voltage through the mat to measure its resistance. Previous post: What is a Faraday Cage?